Quick, what comes to mind when you think about a “lean-to shed”? Hopefully it’s not something like the following! 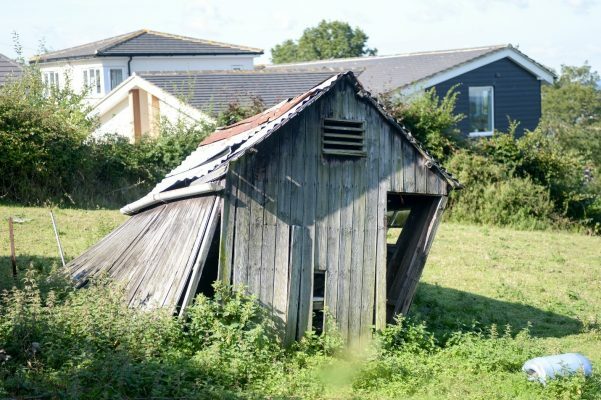 While this shed certainly is leaning, it’s not what we have in mind when we mention a lean-to shed. Here in the Canon City, Colorado area when we talk about a “Lean-To Shed”, we’re thinking of a shelter for our favorite animals. Horses, cattle, and other large animals, as well as smaller ones such as goats, pigs, and even chickens, can benefit from a lean-to shed. A full-scale farmer may have a large barn on his property, but according to Oregon State University’s Small Farms Program, “Animals do not necessarily need or want to live in an enclosed barn every day in the winter and barns for shelter are not practical for large herds of animals such as beef cattle… Livestock can tolerate cold weather if fed properly for it. However, protection from wind and rain will decrease energy requirements and feed costs and increase animal comfort. Three sided sheds, hills, thickets of trees and solid or semisolid fences can all serve as adequate breaks from the prevailing winds.” So if you’re an honest-to-goodness horse or cattle farmer (or just a backyard farmer) we have the perfect, high-quality, low-cost solution for you and your animals! 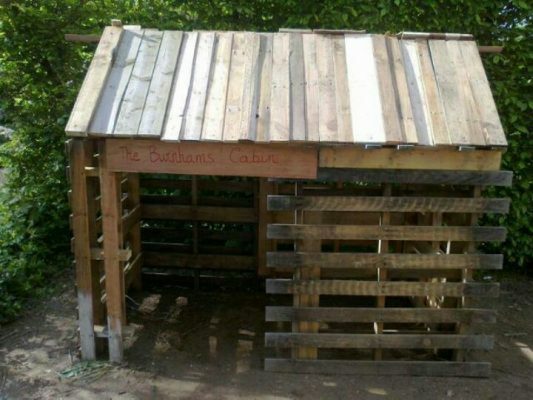 The DIY Method: Lean To Pallet Shed? Well okay, this is lean-to is low cost alrighty, but it sure doesn’t look like it would keep out the Colorado wind! I’m guessing these goat farmers built this someplace at least slightly warmer. And no, this ISN’T the quality solution we just mentioned. 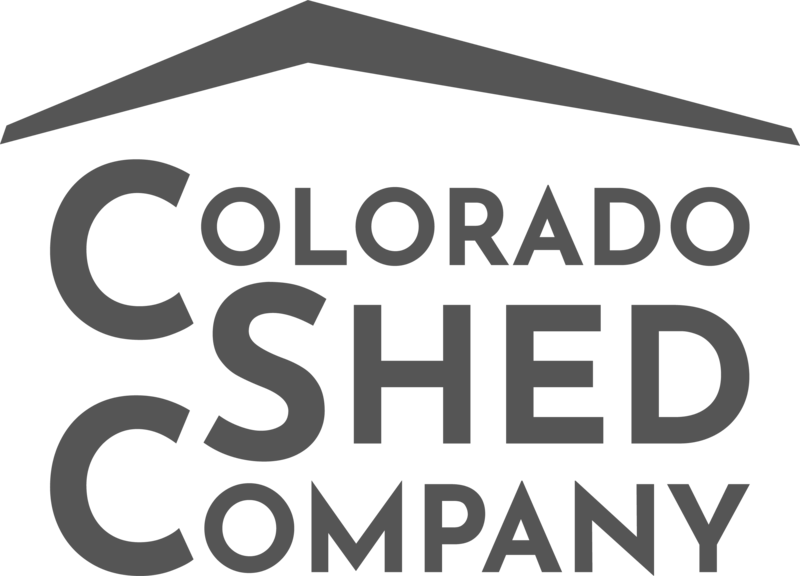 Colorado Shed Company has been providing top quality structures here since 2004. Our mission statement remains the same whether it’s applied to a top of the line Western Storage Shed or one of our sturdy lean-to sheds. While our A-Frame isn’t technically a lean to it will accomplish the same purpose while providing more room for your larger animals. 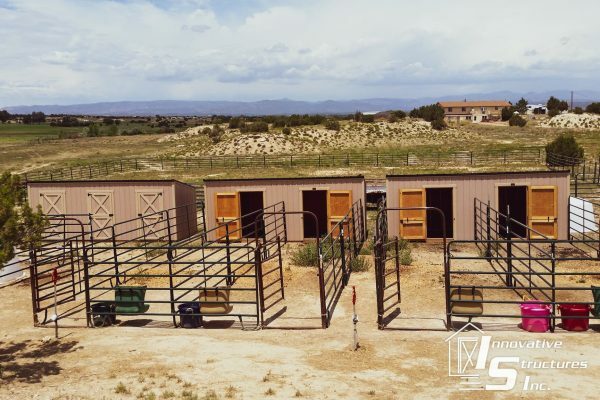 Just imagine your favorite horses making themselves at home in one of these spacious shed buildings. Available in 10×20 or up to 12×36 with many different options to customize to your specifications. Need a door at the end? Done! How about log siding to make it look extra special? Not a problem! Furthermore, we’ll gladly incorporate your unique ideas for the siding, colors, and layout of your lean-to. A High Barn style lean-to shelter might be just the ticket for you if you want extra head room. Besides being roomy for larger animals, there is the possibility of adding a partial loft for extra storage. 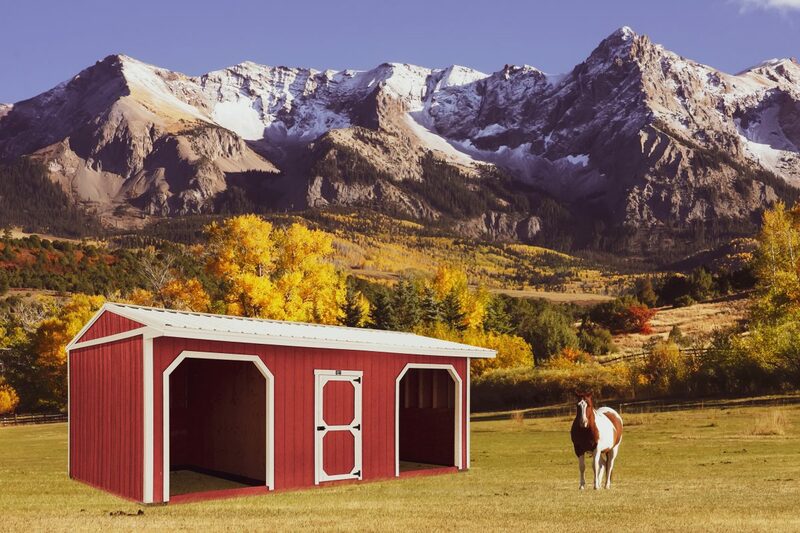 These large sheds in Colorado come in anything from a 16×20 to 24×30…plenty of room for several horses or cattle to browse in and out! Here we’ve arrived at our true lean-to animal shelter. Notice this animal lover’s way of utilizing a few of them. Like this setup or thinking of something else? The sky’s the limit! 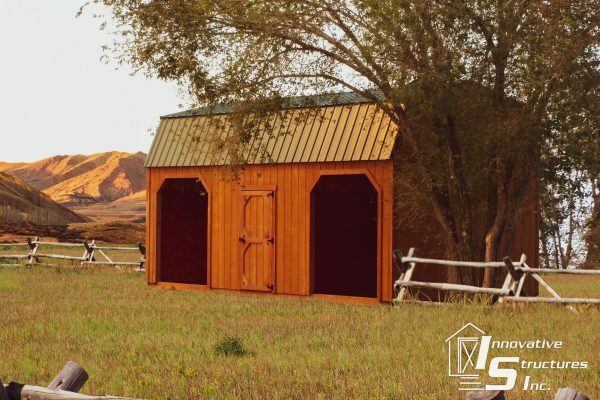 Create the backyard farmette of your dreams by choosing and customizing your own sturdy lean-to sheds! Check out our Animal Shelters page for more ideas. Whenever you have a good idea of what size and style of lean-to shed you’re looking for, get in touch with us for additional suggestions and tips. We like to help our customers by meeting their needs as best we can. With a sturdy, good looking, and functional shelter, your life will be easier and more enjoyable, not to mention the lives of your animals. 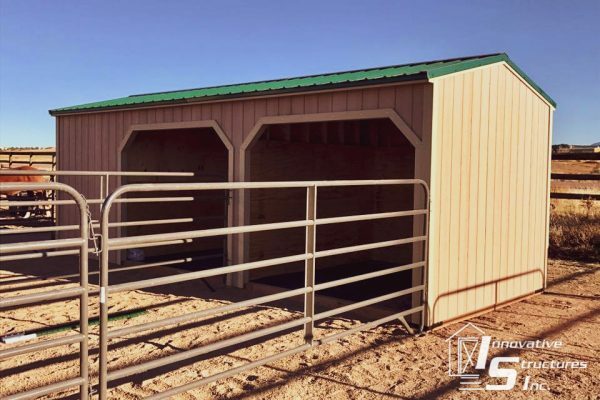 Don’t subject your cattle to another Colorado winter without one of our lean-to sheds on your property! Get a quote or give us a call. This entry was posted in Animal Shelters, Colorado Shed News. Bookmark the permalink.